Justin Trudeau and Nicola Sturgeon mocked Trump's so-called 'Muslim Ban'. Seems other foreign leaders know how to use twitter too, and for good instead of evil. As protests broke out around the country against President Donald Trump's executive order banning Muslims from seven countries from entering the United States, and some foreign leaders also criticized the move, there were some nations that went a step further. Canada, Scotland and Turkey were among the countries whose leaders made open offers to immigrants after Trump's ban. In two tweets Saturday, Canadian Prime Minister Justin Trudeau reaffirmed his country's commitment to welcoming refugees. Canada resettled about 39,000 refugees from Syria between December 2015 and December 2016. 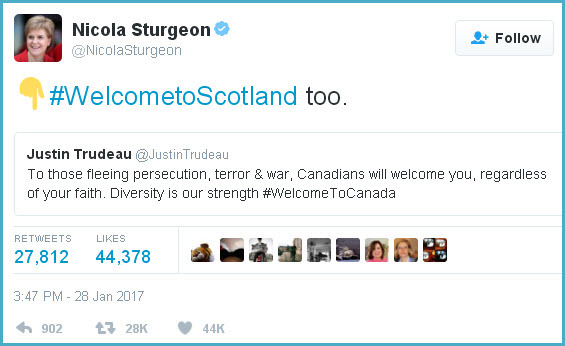 Scottish First Minister Nicola Sturgeon responded to President Trump's executive order by adding her own voice to Trudeau's tweet.